Yikes, the week flew and now it's Friday and tomorrow is graduation! Andrew and I both have family flying in and after commencement we're taking all of them to a Chinese restaurant for lunch and I'm tickled for some reason that there will be twenty five small Asians all in this little restaurant eating together - quite the caravan. Today is for a quick detox because yesterday started with alcohol and cake for dinner and ended with buffalo chicken pizza and cheese stix with garlic butter sauce that I'm sure I double dipped more than once. It felt wonderfully first-year-like and sometimes I miss that time of life but then I remind myself that the first two years of med school << the last year of med school. The chopped chicken salad at the Eagle, I dream about this salad some days. It's the perfect sour-sweet-salty combination and even though their fried chicken is two thumbs up, this salad is that and maybe even another pair of thumbs more? The skyline, in all its small but aesthetically pleasing glory. We drove through lots of cities this year and it's definitely one of the best ones. Definitely. And my family and friends! But I will start crying in front of the computer if I think about that too much so let's direct our attention to the happy things, like this graduation cake! I only call it a graduation cake because I brought it to Audrey's home yesterday and we opened champagne and toasted to the end of an era that is medical school, but it could serve as a cake for other occasions too. In fact, it is the same cake that I made for my sweet friends Kara and Drew, who are getting married tomorrow! Only theirs is smaller and less rainbow and more wedding-apropos. 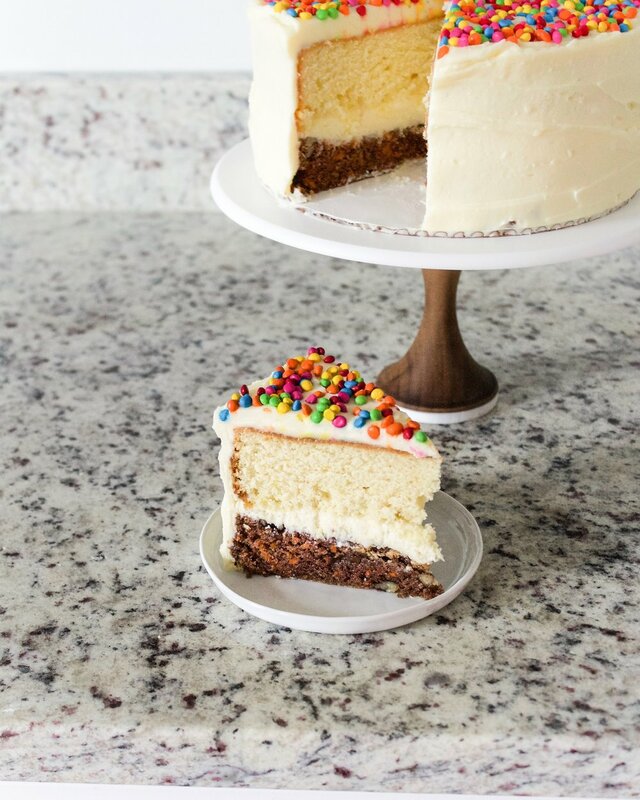 It is a genius combination of carrot and lemon cake, Kara and Drew's favorite cake flavors, both of which pair so perfectly well with cream cheese frosting and feel so very spring. 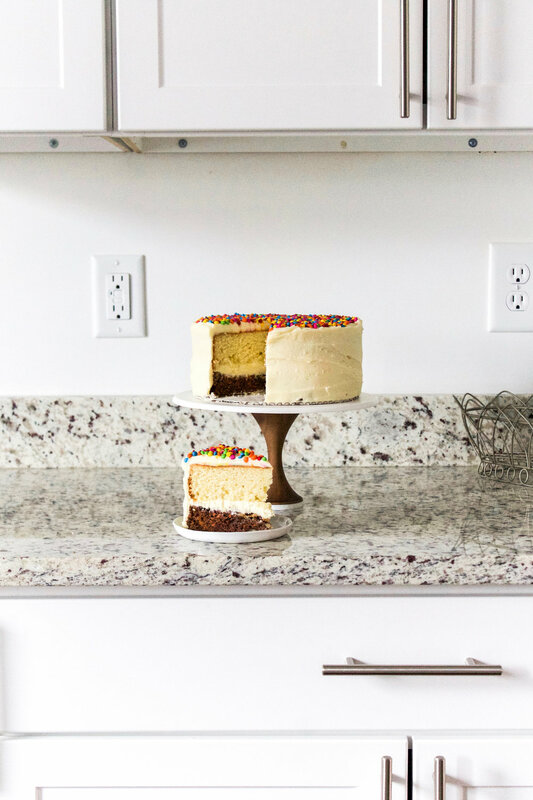 So yes it is a little high maintenance since you'll have to create two cake batters but with a good mise-en-place and a free afternoon on hand, you can have this tasty guy in no time. Whatever occasion you are celebrating - graduation, marriage, Mother's Day - cake is always a good thing! I hope you have a beautiful weekend with lots of good memories. And to the IUSM Class of 2017 - congrats! We made it! Let's go be doctors now. Preheat oven to 350 F. Line and grease 2 8-inch pans with parchment paper, then set aside. For the carrot cake: In a medium bowl, whisk the flour and baking soda together. In a large bowl, whisk the oil, sugar, salt, eggs, and spices until well combined. Add the flour mixture and mix until just combined, then add the carrots and walnuts and mix until they are well distributed in the batter. Pour into one of the cake pans. For the lemon cake: In a medium bowl, whisk the flour and baking powder together. In the bowl of a stand mixer, beat the butter and sugar and salt with the paddle attachment until the butter is light and fluffy and pale, about 4-5 minutes on medium-high speed. Scrape down the sides of the bowl and then add the eggs one at a time, beating and scraping down the sides of the bowl in between each addition. Add half of the flour mixture and mix until combined on low speed. Add the milk and mix again on low speed until mostly combined. Add the remaining flour mixture and mix again on low speed until combined. Add the lemon zest and mix until well distributed but do not overmix! Pour into the other cake pan. For the lemon cake glaze: Microwave the lemon juice and sugar for 45 seconds and stir with a spoon to combine until most of the sugar has dissolved. You may need an additional 15 seconds but do not microwave the glaze over one minute - you don't want to cook the lemon juice! Place both cake pans in the oven and bake for 40 minutes. I would start checking at 30 minutes and then checking every 5 minutes or so to make sure you don't overbake! You'll know when the cake is done if a toothpick placed in the center comes out clean. Once baked, remove from the oven and let cool for 10 minutes, then remove from the cake pans. For the lemon cake, brush the glaze all over the top and sides of the cake. This gets a little messy so I recommend putting the cooling rack over a sheet pan lined with parchment paper to catch any glaze that drips down. Let the cakes cool completely before frosting and decorating. In a large bowl of a stand mixer, beat the cream cheese until it is smooth. Add in the butter 2 tbsp at a time, making sure the butter incorporates into the cream cheese. Add the powdered sugar 1 cup at a time. Add more sugar to taste if 2 1/2 is not enough - but I like less powdered sugar in order to make the frosting sturdier! Frost your cakes, I put carrot on the bottom but either way works! Decorate with rainbow chips, sprinkles, or leave it naked - anything works! Enjoy with lots of friends and family.